In my previous post, one reader commented: “You did a good job of pointing out common ‘sins’ of black tie attire, yet I feel you could explain better why these things are sins. This is a great point. Yes, to a certain extent tradition is the point of black tie. It is one of the few last bastions of dictated dress, where an actual sense of propriety bounds one to wear certain clothes. Beyond some award events, balls and Ascot, nowhere is the modern man more restricted to one particular mode of dress by his fear of offence. Whether that is good or bad is debateable. But like all the rules I have described in this series, the rules of black tie are there for practical reasons. Black tie aims at two things. First, make the man look as smart as possible – to be appropriate to the importance of the occasion. Second, create contrast in material and texture – to create striking effects in dark rooms or under bright lights. So what makes a man look smart? Well, custom has always been that a shirt is less smart than a jacket. And you can see why: thicker, less crumpled material in a darker colour. So keep the amount of shirt on display to a minimum: keep your jacket on and wear a waistcoat or cummerbund to cover the triangle of shirt material that appears below the button. This is also because the messiest part of a man’s shirt tends to be around the waist, where it untucks, and the untidiest part of the trousers is the waist where they fasten. 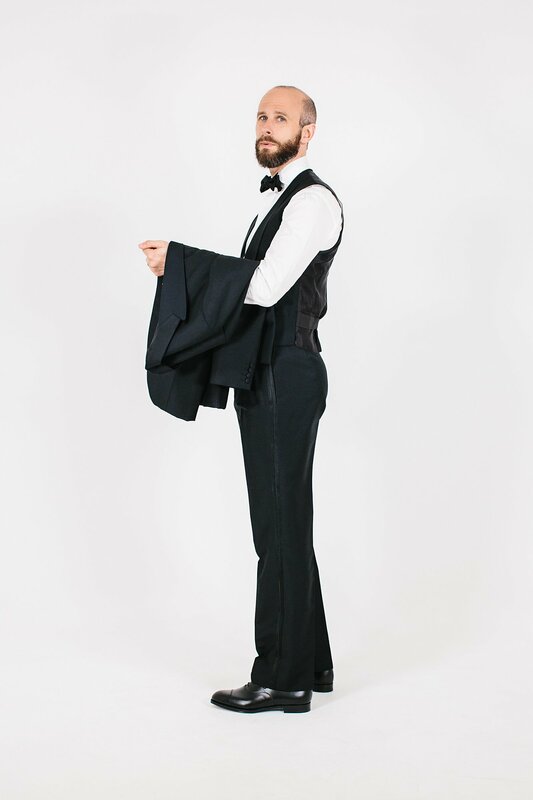 It is hard to dispute that a long, clean silhouette created by a waistcoat and trousers is smarter than one without the top half. Other things that make a man look smart are a stiff shirtfront (stiff being smarter than soft) and calf-length silk socks (a smoother texture and no wrinkles). 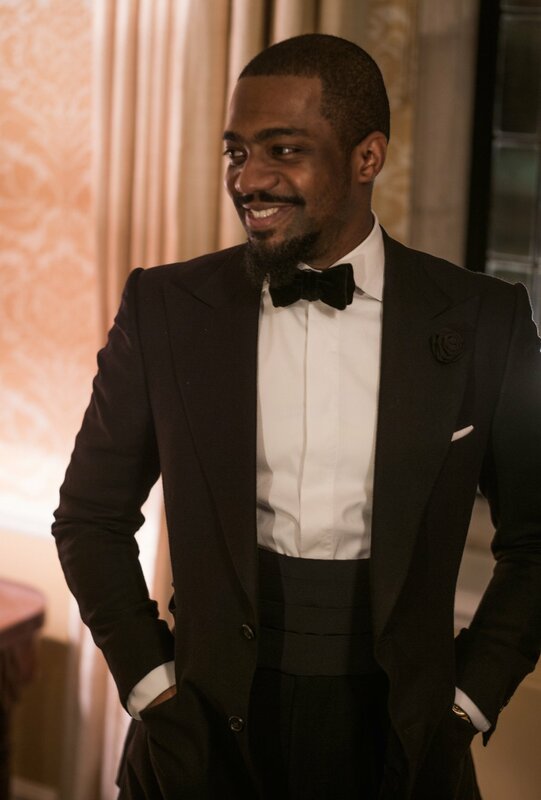 The second aim of black tie, to create contrast in texture, is achieved by a matte finish to the suit and trousers, contrasting with shiny lapels, trouser seams, bow tie and shoes. Hence the reason for patent pumps or Oxfords. As to my second sin, notch lapels, this holds no practical purpose other than to distinguish black tie from the lounge suit. It is sharper and more rakish. I think it is worth maintaining these differences, but worth recognising that there is less practical reason for it. So when you break the rules of black tie – by leaving the cummerbund at home for instance – you should now be aware what you’re lacking in the overall sharpness of the look. You can follow the discussion on The rules and how to break them 6: Black-tie tradition by entering your email address in the box below. You will then receive an email every time a new comment is added. These will also contain a link to a page where you can stop the alerts, and remove all of your related data from the site. Thanks Simon – I have enjoyed both articles immensely. Just a thought – is the concept of a firm and inviolable black tie tradition somewhat suspect when it owes its current form to a sensation caused by Lorillard in 1886 when he broke emphatically with tradition? And thus – given the presence of notch lapels with their fuss-free lines on evening wear since the 1960’s, and their acceptance by very traditional people (www.blacktieguide.com/Contemporary/jackets/2005_portrait.jpg)- isn’t hanging on to this one a tad precious? But this is justout of curiosity – I have as I say enjoyed the articles. This article, as well as the former has been quite interesting. My reading of it was also laced with a hint of humor, being able to view an add for “After Six” immediately beside such an explanation of proper black tie. Black tie was really cemented in its current form in the 1930s, so it’s a little more recent but I take your point. I don’t believe notch lapels are any less fussy than peaked and they have another historical association (though again, this is not a practical reason): the peaked lapel is a direct descendant of the tails worn with white tie, and harks back to that. The shawl collar, by contrast, echoes the soft lines of a smoking jacket or dressing gown. 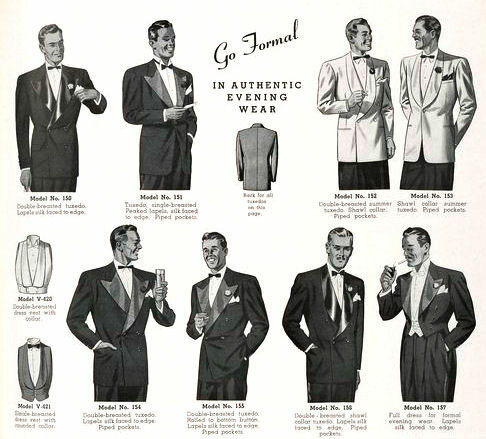 One last reason for me to always avoid notched lapels: the prime reason they are spreading today in black tie is not because people choose to wear it that way out of a desire for personal expression; that I could respect. Rather, it is because makers of black tie are lazy and cutting corners, making black tie on the same patterns as a lounge suit and just putting satin on the lapels. I like your posts. They seem to convey what I want to say much more eloquently. God is in the details, and people don’t realise this. Also, people also don’t realise many things we take as the norm have a reason behind it, as you explained with waistcoats and cumberbunds etc. It will be much appreciated if you have a link to a larger picture. Thank you. great blog, I just found it – and I enjoy it very much. I have an appointment for my first bespoke dinner jacket next week and I am still undecided. In the long run I like to have to TWO different, so I am trying to figure out two nice combinations between the options 1) SB / DB 2) midnight blue / black 3) peak / shawl. I figured out that peak lapel and SB is probably a bit more formal than DB or shawl – have you any thoughts on the colour? So far I’d go for a black SB peak and the later for a midnight blue DB shawl…. And excellent website. I might add there is another dimension to the strict rules on the tuxedo, the semi-formal suit. It is such semi-formal occasions invariable are social and include the wives. The strict convention of the tuxedo is also meant for the men to disappear vis a vis the wives who are wearing the gowns, their chance to shine in public. Tuxedo events are usually for the women. I enjoy your blog immensely, Simon, and am catching up on its older articles. It’s a pity you omitted in this one to mention that black tie essentially originated from the creation in London of Almacks club by Beau Brummell at the turn of the eighteenth century – it was he who stipulated that all men attending his snobby, exclusive aristocratic club in St James’s had to wear only black and white. The move was a reaction against the flamboyant colours and make-up worn by the young ‘Macaroni’ gents who had picked up their colourful attire from French and Italian influences: the aim being to defer to the ladies who could show off their dresses without competition from the men, and to let the men, all similarly dressed in more sombre colours, demonstrate their difference by cloth, cut and detail. Allowing the ladies to be admired without competition from the men also helped guarantee that the club would be attended by the most beautiful and elegant women of the day, thus marketing the club as the most fashionable venue in town (entry, of course, being dependent on cosying up to Brummell himself). That emphasis on a limited colour palate for the men has been the essence of English formal and business menswear ever since, the only modern twist to the latter being the recent habit of allowing some dressing down. It’s interesting also to reflect how wives and girlfriends still hate going to an event and finding another lady attired in the same outfit – another continuation, perhaps, of those 18th century sensitivities. Hi Simon,one point worth mentioning about notch lapels which I have’nt seen mentioned on this question is the notion of the bespoke notch.When people criticize this style they have in mind a RTW jacket which can look pretty awful with this lapel.However,a bespoke tailor can produce a notch that works with formal attire.If the tailor decreases the angle of the notch between the lapel and gorge the overall effect is subtle but noticeably different from a standard lounge suit.If you marry this with grosgrain facings,longer lapel length and one button fastening with an extra shank button you have an excellent look.Hope you can understand my description! I think I do Harry, yes. Like a frogmouth notch, or Camps de Luca/Smalto one? Yes Simon,like your grey Camps de Luca suit.I should also add that the grosgrain facings extend on the diagonal line from the notch in a triangulated fashion ending near the tip of your collar. Please could you add, Simon, a link to a pic of the suit Harry refers to so we can better understand that specific notch look. Thank you for still bringing great articles to the table. I’m getting married this year, and are having a bespoke tux made. I have swatch books available from most of the cloth makers in the UK, as well as Drapers in italy. I am having some trouble choosing a classic and timeless fabric. I like a fabric with some weight to it – live in Norway so doesnt need to be to thin. I was also thinking of heavy fresco. Any suggestions? reference to cloth numbers would be appreciated.